Getting a Visa for a Thai woman or Thai Bride. Foreign Marriage. Getting a visa for your Thai Bride or Thai woman can be the major factor. Dating a Thai woman or planning to meet a beautiful Thai bride? Enter the Visa issue. If you are a foreign national using a dating site in Thailand to find a relationship with a Thai woman or find a Thai bride, the point will come when immigration becomes an issue. In some cases (and increasingly more often) the foreign man may decide to live in Thailand with his newly found Thai bride, Thai woman or relationship partner, but even that raises visa issues. The best advice here is to find an experienced Thai lawyer to handle your affairs. To get a Thai visa solution requires adequate financial resources and the determination to take your lawyer's advice in every respect. One of the things, foreign men should learn from the outset, is that Thai people and the Thai authorities expect you to respect their laws no matter how bureaucratic or complex you may think they are. In this respect, the longer road is the shortest route home. There are many foreign men in Thailand, with a Thai bride or involved in a relationship with a Thai woman, who have found themselves in an increasingly uncomfortable situation by not paying attention to the regulations. Recently, the Thai authorities have tightened up on visa rules, in particular, limiting the number of tourists visas issued to foreigner nationals to three months in order to deal with the growing number of foreign men living unofficially in Thailand or doing 'border runs' whereby they would leave the country and re-enter it within 24- 48hrs. The best advice is to be respectful and responsible. In most cases however immigration issues will arise when the foreign man comes to take his new Thai bride or relationship partner to his home country. The procedures differ slightly from one country to another but the same principles apply. The first bit of guidance here is to be aware of this issue take it into account when beginning or developing a relationship with a Thai woman. Do not underestimate this challenge but do not be afraid to get to the bottom of it either. It cannot be avoided and has the potential to plunge your new relationship with a Thai woman or a Thai bride into confusion and disappointment if not approached in a thorough and robust manner. This process will make you address your relationship with the Thai woman. If the Thai woman is not your bride, it will be difficult to obtain a visa for her if she (or he) is not a person of substance, is not from a wealthy background or is not a professional person operating at a level which requires her to frequently travel abroad. You should also realise that the embassies and consulates have a role to play in stopping any foreign man who, on his first visit to Thailand, brings home a bar girl or a young Thai woman after a whirlwind 'romance'. The best advice to a foreign man who is a member of a dating site and is seriously considering a relationship with a Thai woman is to be honest with the authorities in every respect and examine the options with your Thai bride very carefully before deciding what to do. Depending on the country, it should be possible to obtain a travel visa for your Thai bride or Thai woman to visit your country providing you can show that it is a bona fide relationship, that the Thai woman is a person of good standing, has commitments in her (his) own country and most importantly, that you have the financial resources to support your Thai bride or relationship partner at home. You should be aware at the beginning that your relationship with your Thai bride or Thai woman will be under scrutiny. This may seem unfair but if you try to understand the concerns of the authorities, you can endeavour to address them. If you are legally married to a Thai woman in Thailand, in other words, you have obtained a marriage certificate from a Thai registry office, and then the process is a bit simpler. You must still satisfy the authorities that your relationship is genuine. It is advisable to leave a decent time interval before making a visa application. The process of obtaining a marriage certificate thereby legally marrying in Thailand involves obtaining clearance from your own embassy or consulate, having this authenticated by the Thai Ministry of Foreign Affairs and the registering the marriage at a government registry office. This process can take a number of weeks. It is sensible to take these things one step at a time and to leave some intervals so as to avoid the impression that the marriage is simply contrived to obtain a visa. 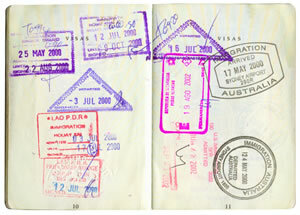 It is generally less difficult to obtain a travel visa if both parties have a valid marriage certificate. However you should understand that the Buddhist ceremony of marriage to your Thai bride is not recognized as marriage in this context. This ceremony or photographs of it can only help to substantiate the credibility of your application with foreign authorities. You can apply for a marriage visa for your Thai bride or even a spousal visa if you have a well founded long-term relationship with a Thai woman, depending on the foreign country concerned. This is an application that you must make from your home country. You must show that you have the capability of supporting the Thai woman or Thai bride and that you are a fit and responsible person. This issue can cause anxiety and frustration but in most cases, the effort is worth it and the process itself can strengthen your relationship with your Thai woman or Thai bride. There are specific internet sites provide assistance with marriage and visa issues in Thailand. To apply for a visa, your Thai bride or Thai relationship partner must have a Thai passport. The Thai woman then applies at the appropriate embassy or consulate in Bangkok for a travel visa to visit your country. The first thing that you must find is a list of required documentation. Be rigorous in insuring that you comply with all requirements and strive to present an honest and accurate picture of your position. Do not be tempted to change your story in an effort to have your visa processed prematurely or to embellish your application. It may be counter productive if not fatal. Another good tip is to talk to others from your country about how the system works and their own experiences. You will be dealing with bureaucracy in Thailand, your own country and elsewhere, it is easy to find contradictory advice. Try to understand the system and keep your applications simple and as close to the truth as possible. Be aware of the duties imposed on government agencies to deal with criminal elements that, however unfortunate, are among those who regularly apply for such visas in respect of Thai women . The authorities are simply trying to protect the Thai women from perils that do exist due to the activities of unscrupulous individuals. You could find that your Thai bride's or Thai woman's application is rejected and you will not know why. This can put a strain on your relationship with the Thai woman and cause you to question your commitment to the process. If this happens, you must try to understand why. You will then have to deal with the fact that the rejection of a visa application will cause more problems for your Thai bride or Thai woman in the future. This is why it is very important not to underestimate or rush the process in the first place. Some embassies and countries such as the UK have extremely sophisticated systems that track such rejections and will cause questions to be asked later as a note will be placed on the passport. Thai girls working in bars in Thailand with little or no education are regularly refused visas. Many have no English or foreign language and have limited education. The consulates and embassies have had extensive experience in dealing with such applications brought about when foreign men meet attractive Thai girls and want to bring them home to their own country. There are many stories published in books and on the internet that shows that this is often an undesirable thing for everybody concerned. No amount of storytelling will help if your Thai girlfriend has a limited education, has no real job and very limited financial resources. You should know that it is not too difficult for a Thai woman from a more privileged background to obtain visas regularly for business or leisure. In many cases, the key to the success of your application is to show simply that there is no problem with financial resources and to state the reason for your trip clearly and succinctly. Embassies are looking out for a Thai woman traveling to your country who may not return. Evidence of property ownership, real and substantial responsibilities including a good job is positive. It is a good idea to consider the visa situation before you visit Thailand and develop a relationship with a Thai woman. If you are serious and committed to finding an enriching and successful relationship with a Thai woman, then obtaining the right visa in a straightforward fashion, is part of your responsibility to her. After you have met or even married your Thai bride or Thai woman, you may concede that this will take some time and make arrangements for her. It is advisable to do things by the book. It will actually save you time and heartache. Do not, however, casually go to Thailand, meet many Thai bar girls, decide to bring one home and then, in order to make it easier, marry her. This will probably result in a nightmare. You will inevitable want to drive on in haste and consequently fail to meet all the procedural requirements of many authorities. You should try to act responsibly. The exotic culture of Thailand can cause some foreign men to lose their sense of reality. While all new relationships are romantic particularly those in Thailand or any foreign country, the welfare of the Thai woman, bride or relationship partner is paramount. It must be considered carefully. It is such consideration, from the outset, that ultimately lends credibility to a successful visa application. Begin your search for a Thai girlfriend, wife or partner here. Key Challenge: Sorting out a suitable visa for your Thai Bride or Thai woman is often one of the most difficult challenges. Many foreign men now opt to relocate to Thailand which presents the issue of a Thai Visa. Understand the Visa authorities: It is good advice for foreign men to understand the visa regulations which are an important safeguard for any Thai woman against criminal elements. Your responsibility to your Thai woman: Obtaining the right visa is a key responsibility of any man serious about finding a successful relationship with a Thai woman.